Family of childhood Playground equipment——The 19th IAAPI Amusement Expo is held in Mumbai, India as usual. As one of the leading companies in the amusement park equipment industry, we also attend this Expo as usual, during 6-8 March 2019, in Hall 2 Bombay Exhibition Center, Mumbai, India. IAAPI Amusement Expo is a three days exhibition that brings a comprehensive range of products and services offered by the Amusement industry under one roof. Even more, big player from the industry will share their learning, innovative idea, schemes, and experience. What is more, apartfromthe business transaction, the show also provides exposure to meet leading manufacturers, parks and leader of the Indian Amusement Industry on a single platform. 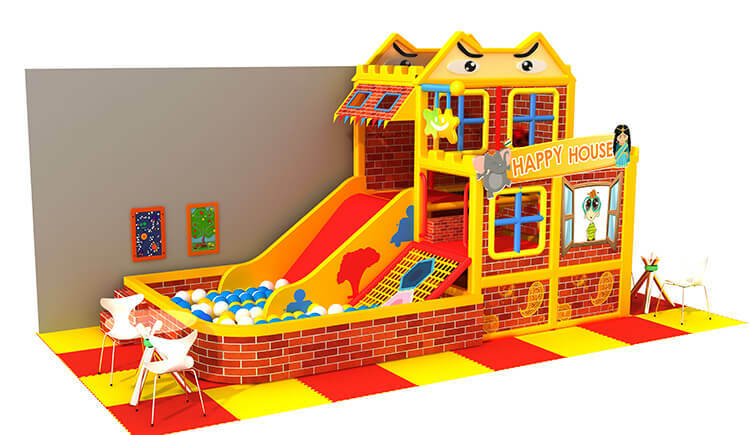 In IAAPI Amusement Expo 2019, our sample for the Expo is a happy house. The inspiration comes from Chinese family: Home. Then, our designer designed a playground like a house, with eyes on top, making the whole design more spiritual and vivid, which has stimulated children’s interest and attract their desire to explore. Of course, we adopted yellow and red color, the popular color for Indian to express the Home theme. Also, the design combines slide, ball pool, climbing net, and other games. It have attracted lots of kids and customer to visit our booth. Many customers come to watch the exhibits and place orders. We have welcomed many important customers. Familyof childhood will return to you in time, please be patient. We have reached a great achievement and build up a good relationship through this IAAPI, and meet many old customers. Then, with years goes by, Family of Childhood has been cooperated with lots of domestic customers and several famous strategic cooperative partners. Besides, our products are hot selling in Europe, North America, Middle East, Southeast Asia, and Africa, etc, which won high appreciation from customers. We believe, IAAPI Amusement Expo 2019, with our continuous efforts, motivation, and keep the mild of the customer first ideal. Also, family of Childhood will become the first class amusement park equipment supplier in the world. So, for more information, you can leave a contact on our website and we will respond quickly.